Catalin Alexandru Duru, an inventor from Canada, set the world’s record recently for the longest flight by hoverboard. Ever since Marty McFly surfed the streets of Hill Valley on a hoverboard, everyone has wanted one. Since McFly’s venture on the hoverboard was actually set in 2015, it only seems logical that Duru’s flight would take place in the same year. 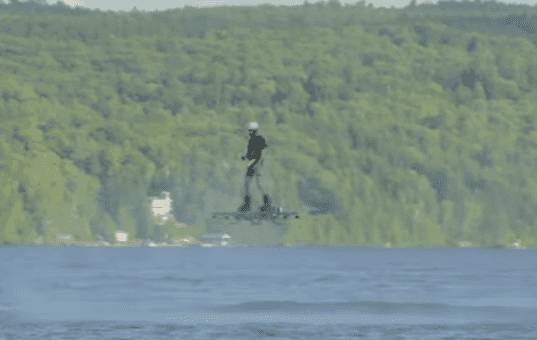 Gliding for over 900 feet (almost the length of two football fields) over Lake Ouareau in Quebec, Canada, Duru earned himself a spot in the Guinness Book of World Records and a place in the hearts of Back to the Future lovers everywhere. In order to snag the record, Duru had only to travel farther than the previous record distance of 164 feet. By hovering a total of 905 feet and two inches, Duru’s record could be intact for quite a while. The board itself can hover over any surface, but Duru smartly tests the board over water, just in case something goes wrong. Duru said he wanted to prove that a stable flight can be achieved on a hoverboard and a human could stand and control one on their feet. Looks like Duru may have just ushered in the next extreme sport. Can it be long before the next Burton starts decking them out and selling them everywhere?